The damper’s job is very simple to explain - to keep the tyre in contact with the ground wherever and whenever possible. How it must achieve this is where the complexity comes in, as it has to deal with a number of continually varying factors/conditions thrust upon it by the car and it’s suspension. To keep things as clear as possible, I’m leaving out all suspension related details. Although intimately related to the dampers performance specifications, it would only cloud the issue to try and cover both in these all too few pages. Remember ‘slinkies’- those wound steel coils that ‘walked’ down stairs and such? Picking them up was an art as they tended to ‘boing’ all over the place. Well that’s exactly what any spring does, no matter how stiff. When stretched or compressed, then released, they all bounce up and down to some extent until this natural energy dissipates and finally settles down. This bouncing up and down’s called ‘oscillating’. The oscillations experienced when springs (rubber 'doughnuts' in our case) are fitted to a car are generally kicked off by the wheels hitting bumps be they lumps or potholes - both have the same result. The wheel’s kicked upwards, causing the springs to contract (bump), then react by extending (rebound) chucking the car about into the bargain. The combined sprung (body, engine, passengers, etc.) and un-sprung (wheels/tyres, brakes, suspension arms) weights affecting how much oscillating goes on, worsened by lumps being hit consecutively - turning the car into a bucking bronco. Left un-checked the ride becomes a stomach churning experience. Worse than that, severe bumps can flick the wheels clear off the ground. Now this can cause all sorts of excitement, as there is a number of very basic functions to successfully pilot a car that rely totally on the wheels being in contact with the ground. Steering. Braking. Accelerating. All impossible to achieve if there’s fresh air twixt wheel and ground! A serious situation multiplied when encountering a succession of bumps. The dampers job is to contain these oscillations in a controlled manner over a wide variety of situations and conditions, so how does it do it? Essentially the damper is a rod with a plunger attached to its base, operating within a tube - bit like a bicycle tyre pump. Operating the pump is easy when the orifice at its base is left uncovered. Sticking your thumb over the end alters this dramatically - easy to operate in one direction, almost impossible in the other. This is because of the resistance caused by the air trapped between the plunger and now closed off end. Uncovering the hole a little at a time makes it easier and easier to operate. Dampers operate in the very same way, although being somewhat more refined. The plunger’s a valve operating in a tube full of oil. 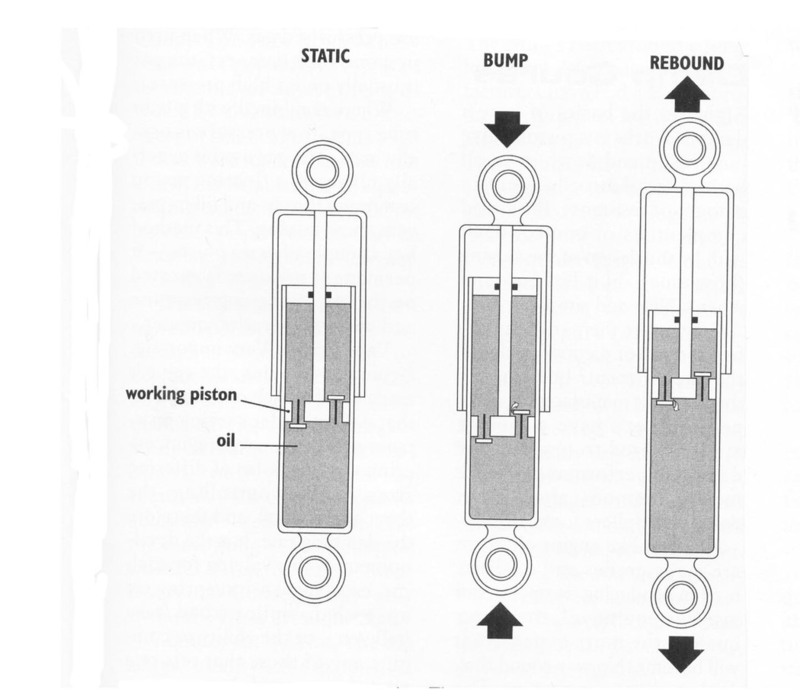 The oil gives resistance, the valve calibrated to allow oil to flow past it in differing amounts to regulate the amount of resistance in both bump and rebound. Combining these two gives the damping needed to control the spring’s oscillations. 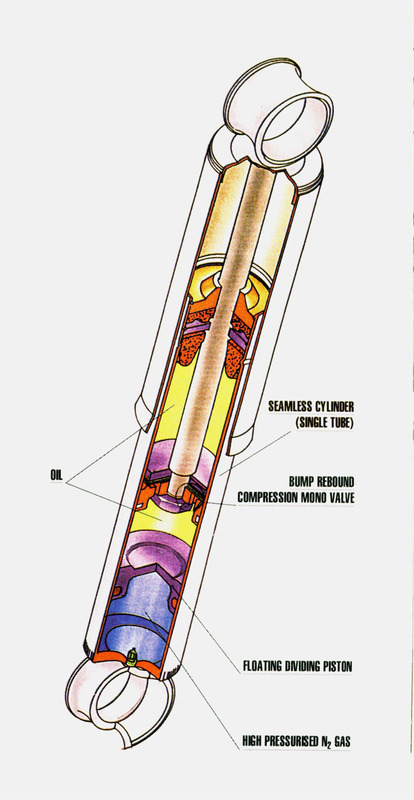 This basic design is known as the ‘mono-tube’ damper. An alternative design is the ‘twin-tube’ type. With this type the pushrod valve deals with ‘re-bound’ resistance. 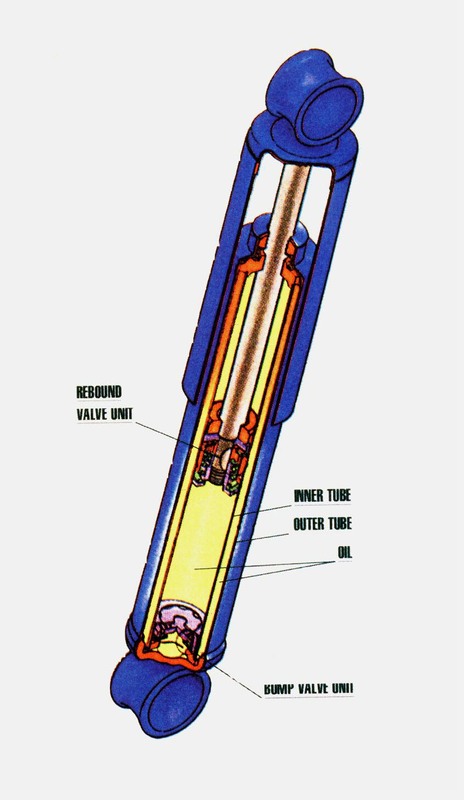 The tube it operates in has another separate valve fitted to the end of it that deals with ‘bump’ resistance, and is placed inside a bigger tube. Contemplate the drawings at the end of this dissertation of each type to compare their relative differences. Intimated earlier, the dampers have to deal with a very broad spectrum of performance in standard trim. Everything from solo pilot on smooth tarmac roads, to fully laden with family on picnic outing into the out back. Consequently ‘compromise’ creeps well and truly into the equation, making the standard fitment dampers somewhat on the ‘forgiving’ side, ensuring a ‘comfortable’ or ‘soft’ ride. Price also determines very basic design, component quality, and indifferent assembly. The situation decaying dramatically when even cheaper, standard replacement, non-genuine dampers are fitted. A couple of years general usage is enough to see off the best performance of a set of standard dampers. Cheaper units end up leaking their precious oil out because of poor quality components, and most suffer from oil degradation - the oil becoming thinner with use, so vastly reducing the effectiveness of the damper. All this leads to loss of control of the spring with the horrendous and potentially very dangerous scenarios outlined earlier - loss of traction, be it for accelerating, braking, or steering. On a Mini you’re often doing at least two of these at the same time due to front wheel drive. Correctly functioning dampers are an absolute must. Up-rated or high quality ones can dramatically improve the cars handling, but which to choose? Right, so the basics of how a damper works is a piston/valve moving up and down in an oil bath. The oil affords a certain amount of resistance, the varied complexities of control dealt with by the design of the valving (how much oil it lets past and when). Nice and simple. So why are there so many different types of damper made for the same fitment? Ignoring for the moment manufacturer competition, let’s have a look at methods used to up-grade the damper’s performance by the most common aftermarket damper suppliers for the Mini (i.e. not race orientated exotica!). Oil. Just like engine oil, there are many grades and qualities used in producing dampers. And just like engine oil, the better quality the more expensive it will become. No way round that. And quality is important. The oil’s an essential element - if it wasn’t there the damper would be useless. It has to maintain constant performance over a wide range of temperatures - typically for standard production units between -20 degrees to +120 degrees C (-68 to +248 degrees F). It’s also responsible for lubricating all the internal moving components - again necessary to maintain performance over a long period. The harder the damper works the quicker the oil degrades - constant use on rough ground or high frequencies experienced when racing with hard settings. The latter can work the damper so hard excessive heat’s generated, burning the paint off the body! You can’t change damper oil like you can engine oil - practically all dampers that you’re likely to come across are sealed. So high-grade oils are necessary, facility for periodic replacement would be ideal. High damper speeds (very rapid movement up and down) can cause the oil to become aerated, causing foaming. This vastly reduces the oil’s resistance, and consequently the damping efficiency. To limit aeration foaming, some manufacturers use pressurised gas. When used in mono-tube dampers, the gas is usually under high pressure. Where combined with a twin-tube type, low pressure is usually used. The gas used is generally nitrogen, a floating piston separating the gas and oil to prevent them mixing. This method has a couple of extra bonuses - a permanent pressure is exerted on the oil, dramatically improving response and quieter operation. Valve design. Far too numerous and technical to outline here, but of great importance. Generally speaking, the valve is made up of a stack of shim plates that deflect under varying resistance pressures, covering/uncovering various holes of differing sizes. Thus controlling the throughput of oil, and therefore the damping rate. It is the development of this valving for each car, each suspension/spring set-up, each discipline (road/race/rally/etc. ), or the ability to combine any of these that sets one manufacturer's dampers apart from the others. The mono- tube can restrict effective valve area where space is limited, i.e. making the tube very small in diameter. Performance increases are only possible with highly developed and comparatively more expensive valve design. Because of this, most adjustable sport/performance dampers are of the twin-tube design. Adjustability. It has become ‘vogue’ to have adjustable dampers on your Mini; mostly because of bar stool bullsh*t requirement, as few who use them ever adjust them. Or would be able to discern differences of small adjustments even if they were made come to that. The fact that a few manufacturers are producing ‘adjustable’ dampers at purchase prices that can only be described as ludicrously low suggests that they’ve identified this syndrome. The adjustment leaning itself more to correcting damper performance loss caused by oil degradation over time than actually contributing to the performance envelope of the damper. Some are adjustable ‘on car’, others only adjustable by removal. Whichever type of adjustment used they all achieve the same thing - restricting oil transfer from outer to inner reservoir. Consequently only twin tube types are adjustable. Component quality. The adage ‘quality isn’t expensive, it’s priceless’ springs to mind. It’s absolutely impossible to produce an effective, efficient damper for next to nothing. A truly effective damper will use fully and properly developed, high quality components, produced to exacting tolerances to ensure efficient and consistent performance. After all, it’s no good having a set of supposedly matched dampers doing different things at each corner - and this happens, believe me! The Mini’s been around a long, long time. Many damper manufacturers have had a stab at producing dampers for it - some more successfully than others. The problem lies in the rubber cone spring. It works nothing like a normal spring, so is extremely difficult to evaluate. Only those that have put the time into development rather than copying some one else’s design, or pure guess-ology, have managed to produce dampers of worth. Strangely enough, it seems to be those that have appeared on the scene more recently (say in the last 10 years or so) that are winning the day. Any changes made that deviate from the standard set-up such as wheels/tyres, disc brakes, bigger disc brakes, or anything else that increases the un-sprung weight at each corner will necessitate an improved damper. Retaining the standard ones is folly, cheap replacements dangerous. When replacing the standard damper on a totally standard car, go for a better grade. Price wars abound, but does not mean to say you are getting the best deal. As I pointed out earlier, quality cannot come cheap. If you don’t really need adjustable dampers, don’t buy them. Especially cheap ones. Their performance may well be less effective than decent gas pressurised, non-adjustable, mono-tube types, which are even cheaper. If you really need an adjustable damper, it’s because you need the virtues the name implies, with re-buildability a bonus, so expect to pay a little more. A decent set of dampers will transform the 'handling' of your Min. Trust me. To save a myriad of ‘phone calls, e-mils, etc., my preferences are - Kayaba Gas-a-Just non-adjustable, Avo adjustable. Amen. Basic mono-tube damper design. The piston has two valves in it, one opens as the damper compresses (bump - centre pic), the other when it extends (rebound). Essentially, larger orifices allow greater oil throughput over small/low speed bumps. Bigger/multiple high speed bumps actuate components in the valving to make the orifices smaller, reducing throughput, giving more control, thus keeping the tyre in contact with the ground. The design of these valves is very complex, their development and quality makes one type function more effectively than others. Ubiquitous twin-tube damper. Generally more widely used where limited working space demands small diameter tubes. Valve area/effectiveness is increased as two separate valves are used. The one fitted to the piston rod deals with rebound control, the one built into the inner tube base deals with bump control. When in bump mode, the oil’s forced through the bump valve into the outer reservoir between the inner and outer tubes. In rebound mode, it’s forced through the piston-mounted valve, and also drawn back through the base valve to replenish the inner reservoir. Low-pressure gas-filled twin-tube damper. Operates in exactly the same way as that in diagram 2, except performance is improved by replacing the air above the oil with nitrogen under low pressure - typically 2.5 to 5 bar. This helps reduce performance-sapping aeration foaming of the oil, and slightly improves damper response. 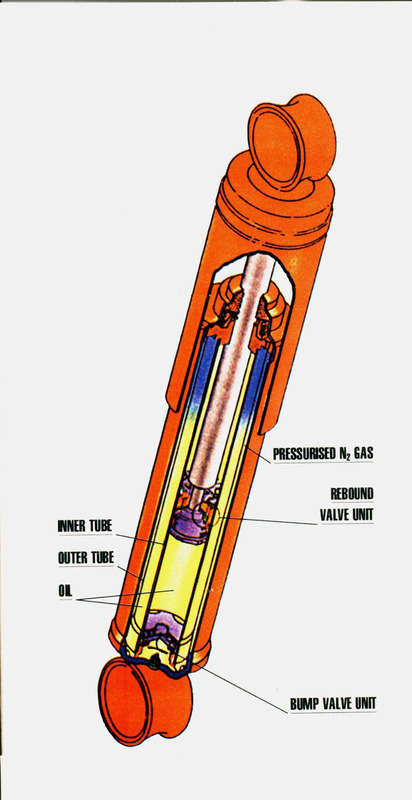 High-pressure gas-filled mono-tube. The piston mounted valve does double duty, dealing with both bump and rebound control. It therefore has to be extremely well developed, and made of quality componentry. In this case, the nitrogen is introduced under high pressure - typically 25 to 30 bar - to the base of the damper. A floating piston’s used to separate the oil and gas. When assembled, the air gap is completely removed by this design, vastly improving damper response, and virtually eliminating aeration/foaming. Nitrogen is slightly compressible. Combining the effects this has with superior valve design, it’s feasible to produce a ‘self adjusting’ damper. The result’s a damper that can out perform many cheap adjustable types. It's mono-tube design also means the damper body is slimmer than the more conventional twin-tube. This helps alleviate tyre-rubbing problems where wider/deeply inset wheels are used. Although I have implied with-in the text that the mono-tube damper is at a slight disadvantage to the twin-tube as far as valve performance goes - a quality designed and manufactured mono can easily eclipse a cheap twin-tube; adjustable or not.